Hello, everyone! Alissa and Latifah, the godmother and president of the Los Angeles Modern Quilt Guild (the original chapter) have contacted all of the founders of the branch chapters and asked us to post about what modern quilting means to us. 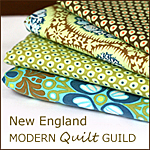 They have a description up on the Modern Quilt Guild blog here, and you can see responses and posts here. We want this to be an open dialogue; please comment on my blog, your own MQG site, their blog, or your own (just make sure you broadcast the link, so we can read your thoughts). At first, I worried that my conception of modern quilting was too amorphous for me to even attempt to record it, or that I would not do so in a way profound enough to encapsulate even one part of the movement. But then I began reading others’ thoughts and writing my own, and I realized that I do have a general notion of what I feel comprises modern quilting. First and foremost, I believe that it is quilting that crosses racial, ethnic, and socioeconomic lines and carries influences from all communities. There are probably very few among us that can say we have not been influenced by the quilts of Gee’s Bend, which were created by an insular community of African-American women out of scraps and sheer necessity. Similarly, many of the fabrics I consider truly modern are from Japanese designers like Kokka, Echnio, Yuwa, and Olympus. The Japanese aesthetic has had a strong effect on many quilts we would call modern. Modern quilting encompasses all groups and aesthetics (including very traditional groups like the Amish); it does not adhere rigidly to the “rules” of any single tradition or cultural aesthetic. Second, I believe (and some may disagree) that modernism, in quilting, implies freedom in both aesthetic and technique. It seems that the times when one would consider only perfectly-matched points the sign of a beautiful quilt or craft project are gone. One thing I love about quilting, as opposed to knitting or other crafts, is the decreased emphasis on making sure every single stitch is 100% straight, perfect, etc. We improvise and wonkify even when we don’t need to do so. The use of untraditional/unconventional construction methods seems to be a dominant and welcome characteristic of modern quilts. I don’t like planning my quilts in advance–I like to begin with a general idea and move and adapt as I work. I start sewing, then add and remove fabrics and shapes as necessary. I improvise. Almost all of my FOs look quite different than my original sketch, and I’m happy with that. I like it to be an active process (my design, my fabric choices, my idea, my emotions), and the concept of modern quilting frees me up to do that…and to make and embrace my own mistakes (that said, if making sure every seam is perfect and the quilt is exactly planned IS what modern quilting means to you, more power to you!). I like Elizabeth Hartman’s idea on the MQG blog, which says: “…I see modern quilting as being more interested in reinterpreting patchwork in a stylish way that could fit comfortably into a contemporary home. For me, this often includes bold color schemes and lots of solid, neutrally-colored areas.” I couldn’t have said it better than that! It makes me think of Joelle Hoverson, Denyse Schmidt, and others that have shown us that patchwork helps us produce beautiful homes and beautiful lives—for ourselves and others. I’ll get off my soapbox now. I want to hear YOUR thoughts! It is about breaking some of the ‘rules’ of traditional quilting–using embroidery floss instead of quilting thread, incorporating fabrics of different weights/textures that maybe aren’t ‘supposed’ to go together, letting your patchwork be a bit wonky rather than completely adhering to the grid. Overall, modern quilting is about having fun with the process, maintaining respect and recognition of the amazing quilting tradition while loosening it up. We are so fortunate to have this movement because quilts are incredibly powerful, comforting, and artistic objects that are now finding their place in contemporary art, craft, and design. I completely agree, and love your idea about using unusual elements like embroidery floss and unusual fabrics! These and many other known and unknown artists have made this craft their own, twisted it into a way of painting with fabric and creating clean lines on this very traditional canvas. I am totally intimidated by quilting, mostly because I don’t think that I have the right equipment, but I would really like to learn so that I could attempt to begin to design for myself. My first project was a simple quilt from Joelle Hoverson’s Last Minute Patchwork and Quilted Gifts: http://www.purlsoho.com/purl/our_books. I thought that I was selecting a good starter project, but in the end it turned out to be more difficult because the pieces were actually big and therefore unwieldy for my little machine. I am looking forward to trying again and also trying to create a quilt using a paperbag technique that I read about via Denyse Schmidt. I think that the random nature of that type of quilt will be less intimidating for me as a beginner.